This is the accessory I made for the City & Guilds. 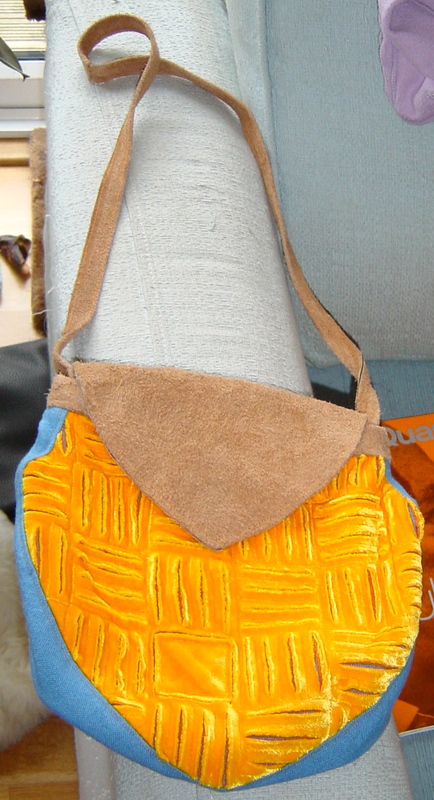 It’s a handbag based on a picture I found of a Moroccan mosque. The fabrics are all hand dyed. 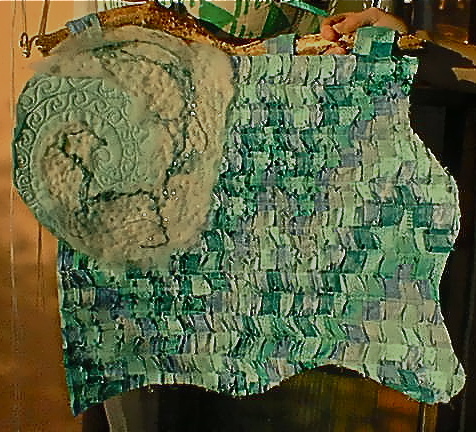 The blue edging is an upholstery weight linen, dyed using Dyrect dye from Omega Dyes. The front and back are made from layers of cotton dimity, fine linen, silk, and silk velvet. All were dyed in the same batch of Dyrect, but each fabric took the dye with a different intensity. 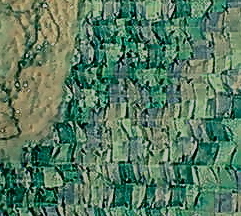 The fabric was stitched onto a linen backing, quilted into grids, and then slashed in different directions. 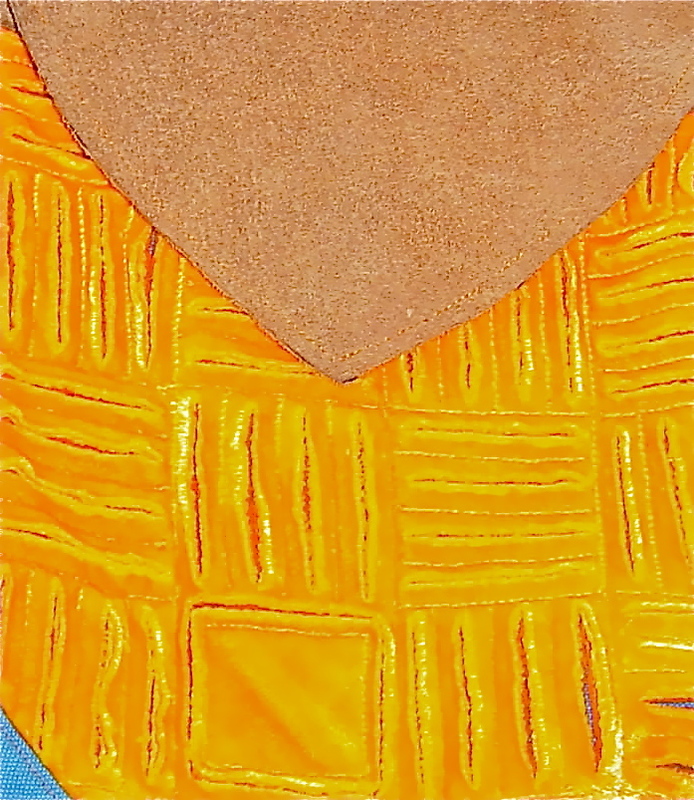 Each fabric, at a slightly different colour, breaks through the slashing, giving a depth and movement to the colour. The velvet and silk also give a slightly chenille effect. If I had slashed on the bias rather than along or straight across the grain, this chenille effect would have been enhanced by the way the raw edge would have frayed. The edge, flap and handle are made from leather I got in a bag of scraps from Croft Mill, who used to do a marvellously eccentric catalogue selling roll ends and odd bits of stuff, which they now seem to do online: result! 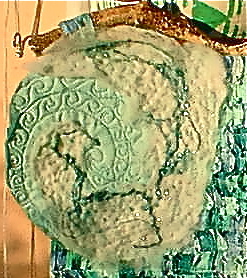 You should totally read it – it’s full of treasures you’ll not find the like of elsewhere. 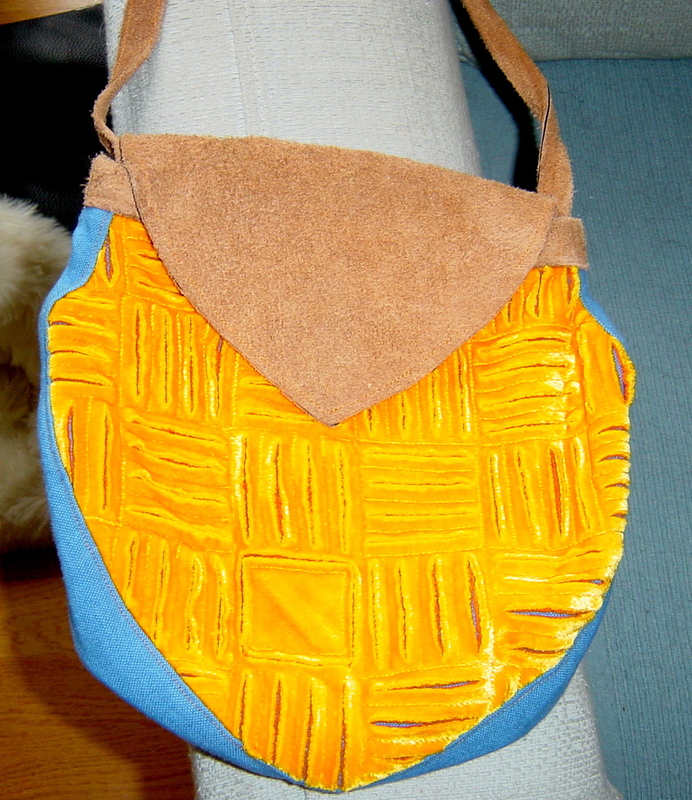 I never use this bag – it’s really not my thing at all, but every once in a while I stumble across it in a corner of a wardrobe, and I have a happy moment, simply stroking it. It does feel utterly lush! 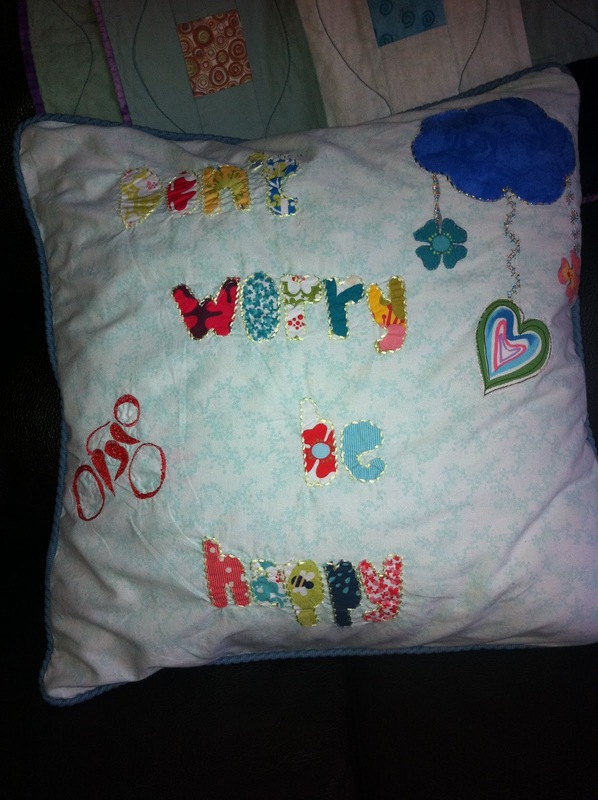 This is a cushion I made for a very lovely friend. We saw one a bit similar in a shop window, and he admired it. So I made him one to celebrate a new job. It involved applique, piping, machine embroidery with the feed dogs and free machine embroidery based on my own drawing – combining some of my favourite things with some of my least favourite things. But that’s what friends are for, right? And the next two pictures are… well… pictures. Painted pictures. These are recent – made within the last month. 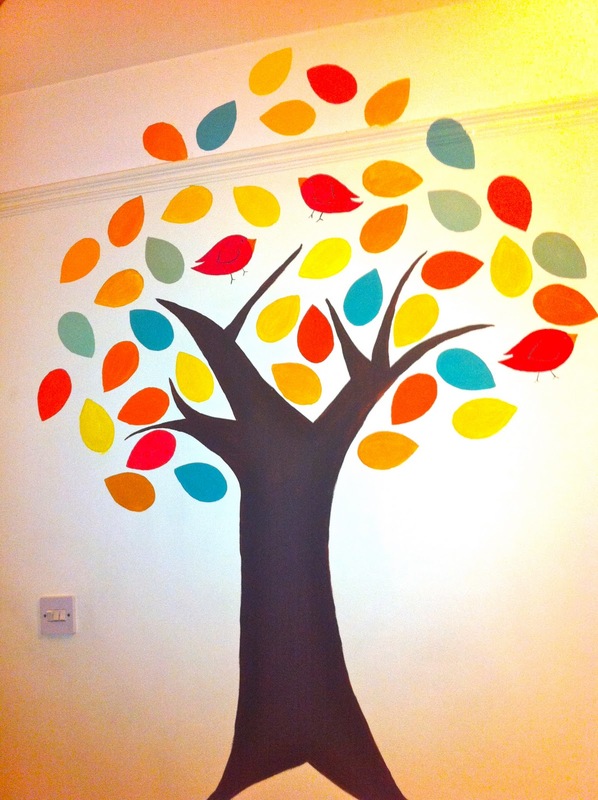 I’ve never really done painting before, but after a stressful meeting, I found myself at home, drawing on the hall wall in precisely the manner which would have earned any of my children a resounding, heartfelt scolding! I was making a mural. When you’ve never done anything before, tackling it for the first time without thinking about it, in a place where it’s immediately visible to anyone who walks through the front door, isn’t necessarily the best plan… but once I’d started, I rather had to carry on until I’d finished. And I have to admit, I like this tree. A couple of people have commented that the colours are very Orla Kiely, and I guess I see that – but it wasn’t intentional at the time. 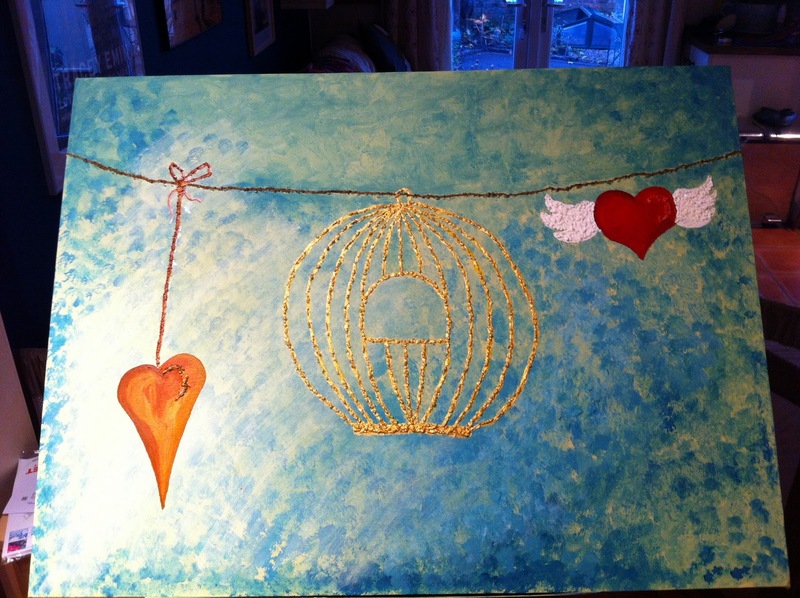 I don’t think it’s startlingly original, but actually I quite like the finished piece. And that’s it. My forgotten photographic discoveries. I work at a University which, like all good Universities, has a healthy and active fundraising campaign. The money we raise funds initiatives such as scholarships, cancer research, new buildings – a diverse range of projects, in other words. It’s often forgotten that universities are *not* public sector institutions like councils or hospitals. They are charitable institutions. So, one of my colleagues has arranged a Christmas craft fair, and I rashly agreed to make her some things. So the last few evenings have been consumed with knitting/crocheting mug cosies: these are, to my mind, rather pointless things which sit around your mug. 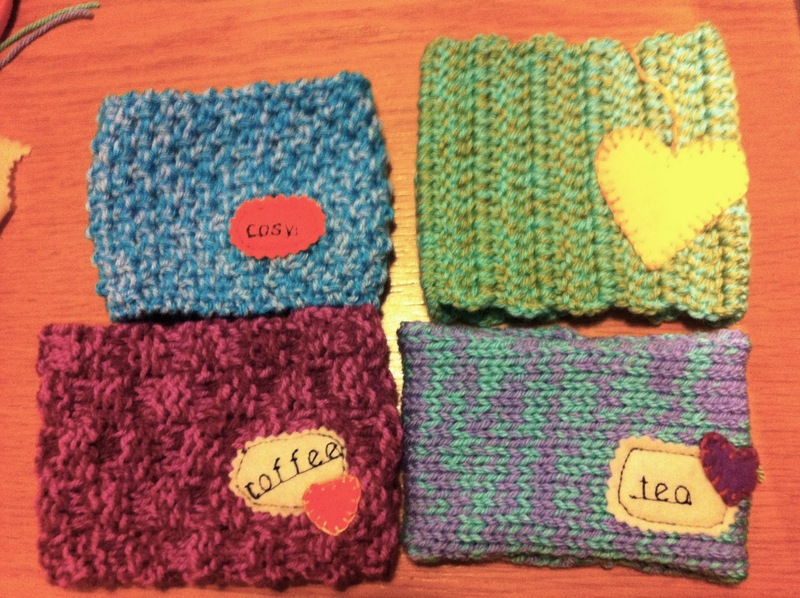 Like a tea cosy but, erm, for mugs… Strikes me that the contents of the mug still have enough surface area to cool quickly, and all you’re going to do is spit stuff on the woolly cosy, but whatever… I’ve made a handful for the Uni craft fair, and here are a few of them. I’ve also made some monsters – I saw something like this at a vintage fair I visited recently, and wondered if they’d be fun to make. 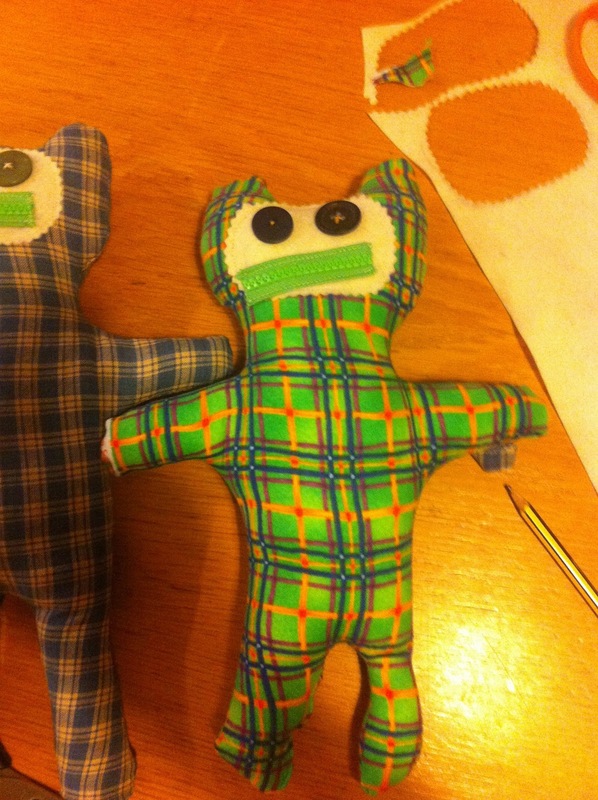 I like rag dolls, and not having any very tiny children to cater for just now, I don’t make them very often, but one evening I sat down and knocked up some zip-it monsters. These are quite endearing, wonky creatures. 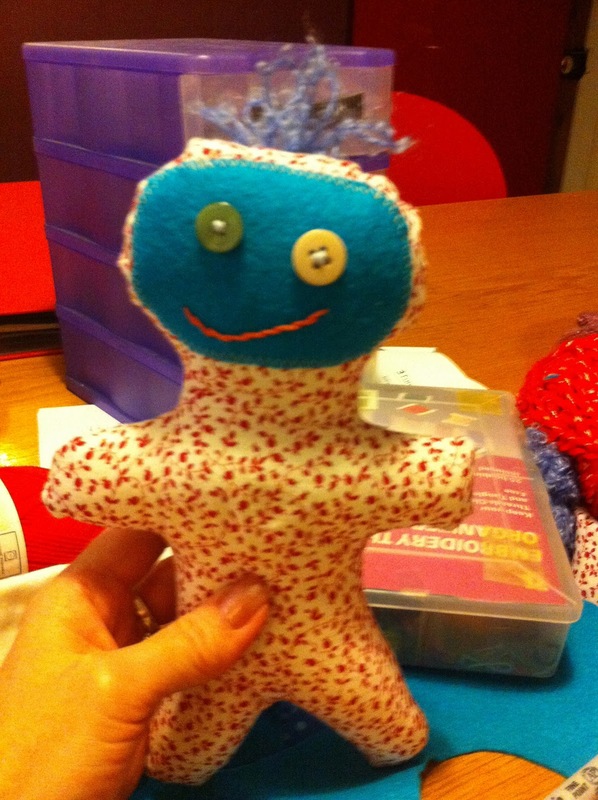 I made another for my nephew’s birthday, yesterday, and it was an instant hit when I gave it to him today. That you can’t do without. And on the desk you slam it. My son has decided he wants a quilt for Christmas. 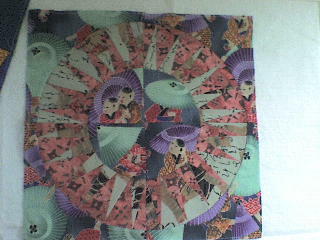 Only, he wants a jeans quilt, and I’m more than a little bored of making jeans quilts, having made two or three, now. So, having flicked through issue 7 of Mollie Makes, and seen a jumper quilt, I thought I’d give that a go. I didn’t quite trust the Mollie Makes method, which was simply to cut jumpers into squares and stitch them, leaving edges unfinished. I’m sure they’re right that the edges *wouldn’t* fray. But what’s the point in owning an overlocker, right?? 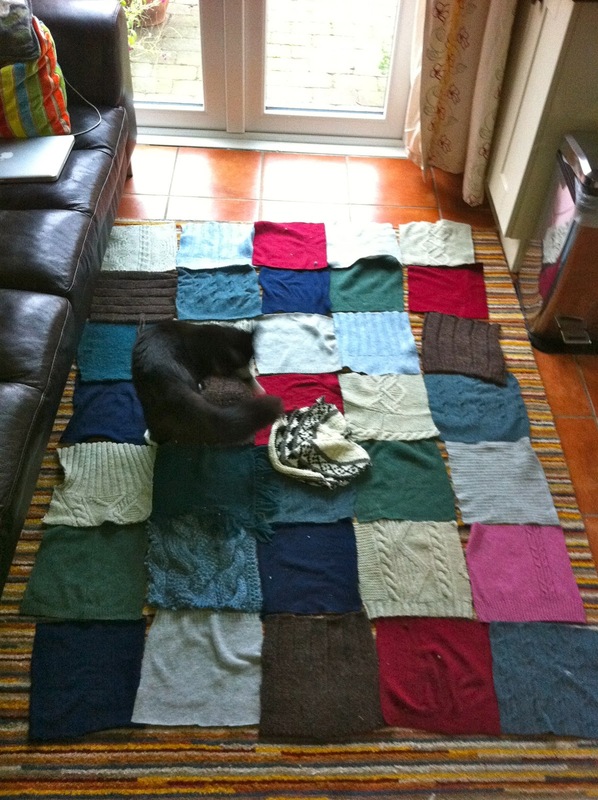 Eventually, I found enough jumpers, in enough non-girly colours, to put a quilt together. I whizzed the squares up in the overlocker, using a cherry red woolly nylon thread, to contrast. I deliberately arranged the jumpers so that some were displaying the right side, and some the wrong side (the reverse of cable knit is often quite interestingly textured). I have included seams, pockets, buttons, cuffs, ribbing from edges and cowls. Some are hand knitted, some are machine knitted. Some are thick, some are thin. Some are harsh and scratchy like jumpers from my childhood. Some are luxuriously soft and strokable. As I stitched them together, I left some seams on the reverse, but exposed some on the right side of the quilt, where the red thread provides some necessary brightness to the otherwise masculine colour tones. I was trying to think of a theme to embellish – my son is at an age where he enjoys video games, but little else, and I don’t know enough about video games to be able to reproduce anything other than pacman, or perhaps Sonic the Hedgehog – neither of which would be greeted with more than a blank. I was rescued by a wonderful colleague who suggested Tank Girl, whom my son adores. 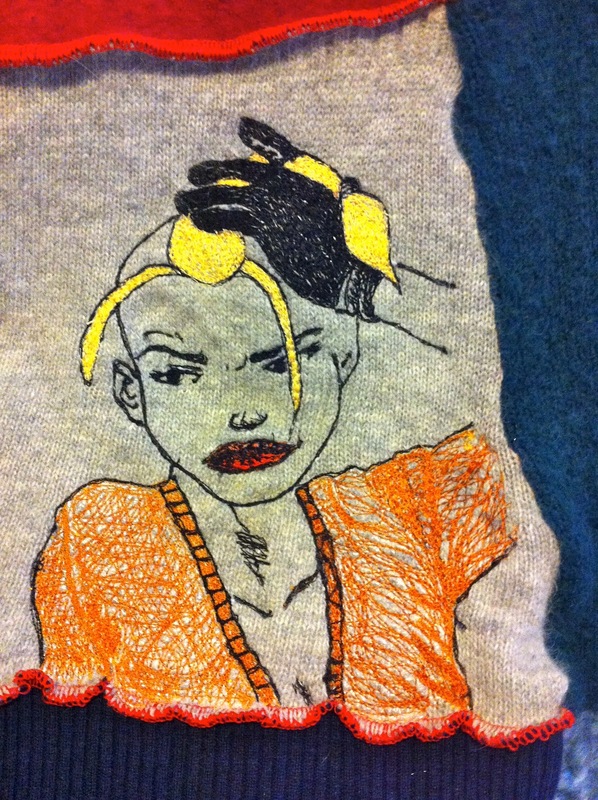 So I copied a Tank Girl image onto a nappy liner, pinned it to a pale grey cashmere block and carefully stitched round it with plain, polyester sewing thread, leaving a faint outline on the wool. Then I tore the nappy liner off, ironed some fusible facing to the reverse of the block, put some dissolvable stabiliser over the top of my design, dropped the machine’s feed dogs and let rip with the embroidery threads. I’m really pleased with the result! The expression isn’t quite the same on the quilt as it was on the drawing, but it’s a credible expression, nonetheless, and there are, if you scroll in close enough, individual eyelashes, and a little frown. And look at that ear!!! The quilt will be backed with white microfleece, and each block will be loosely hand quilted with a red sock yarn. This is my church. This is where I heal my hurt. 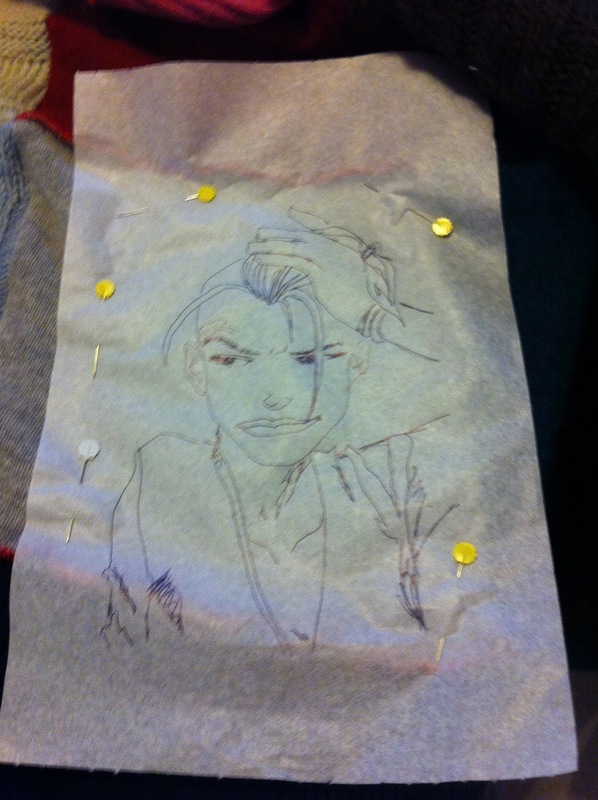 God is a sewing machine.